I made this cut file in Silhouette Studio by scanning a two piece tag from a piece of clothing I bought and then traced it (Butterfly icon) Fun, right? The "Congrats" die cut is 5 layers. I just cut it 5 times and then glued the layers together. The tag I scanned in had the brand name where I stamped the word "Enjoy!" It made me think about what a fun tag it would make for a gift! I used dimensionals and stamped this butterfly stamp from Close to my Heart. This cute cut file is from the Silhouette Design store. Pillow Boxes are so fun and easy! I cut this pillow box at 6" from the Art Philosophy Cricut Cartridge. The hearts and swirly border are die cut. I stamped the sentiment with a permanent black ink and inked all of the edges with Walnut distress ink. I cut the paper borders along the bottom with a paper cutter and then hand trimmed the edges so they would match the curve of the pillow box. I hope they love chocolate! My sweet daughter-in-law and I made some fun Winter birthday cards together! Same card . . . different colors. This is the card my daughter-in-law made. Isn't it cute?! The cut file is from My Scrap Chick. There is even a tutorial. I inked around the edges of the scarf piece and nose and then added a little chalk for the cheeks. A simple Christmas card . . . 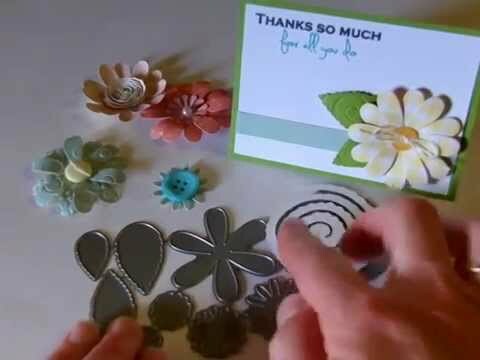 I love this pretty cut file from the Silhouette store! I used stampin' up dimensionals to pop up all of the layers, then added my stamped sentiment. . . . . in a few days! This cute little monster is from the Cricut Mini Monsters cartridge. I used a Peachy Keen face stamp for the face, colored the eyes with a white gel pen, then added glossy accents. Everything piece of my monster is inked with a slightly darker shade than the colored piece.